Piano, guitar, saxophone. 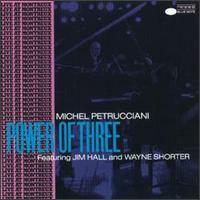 Petrucciani, Jim Hall, Wayne Shorter. A live recording in from the 1986 Montreux Jazz Festival, recorded when Petrucciani was only 23 years old...amazing. The enthusiastic crowd applause seems to fully appreciate the musicianship on display. 1. Limbo - piano, guitar, sax. A cheerful opener composed by Shorter. 2. Careful - piano, guitar. A darkish, rhythmic exploration. 3. Morning Blues - piano, guitar, soprano sax. A sad-sounding ballad. 4. Waltz New - piano, guitar. Starts off with a nice child-like melody which seems to quickly turn into Someday My Prince Will Come in the Miles mood. Petrucciani pulling out some Wynton Kelly stuff here and there. 5. Beautiful Love - piano, guitar. Perfect material for Hall and Petrucciani. Moves quickly and exciting through 7-plus minutes of the beautiful love of jazz. Listening to Petrucciani and Hall trading ideas is nice. 6. In A Sentimental Mood - piano, guitar. The classic Ellington ballad as it is usually played. 7. Bimini - piano, guitar, sax. Modern, compositional sounding song. Latin dance beat... calypso? Note that Wayne Shorter only plays on three tracks. Power of Two...Sometimes Three, perhaps? They say it's one of the best jazz records ever, but I really hadn't paid much attention over the years. Probably that's due to two things - it being labelled free, or avant-garde jazz, and the lack of a pianist in the ensemble. I dunno, I just like to hear chords and have the warmth of a piano supporting the music. But, there comes a time when we let go a little and pick up those historical legends to find new discoveries. That's what I finally did, when Tower Record stores were all closing down and it was possible to get tons of stuff on the cheap. It's a fun, enjoyable recording (even though now as I listen to it I think I probably won't pull it out all that much - maybe while cleaning or distracted with other things). A little bit wild and abstract like modern art, and some of it did remind me of madmen or drunks howling together in the streets... but not in an offensive way, if that makes sense. Six songs, seemingly structured more than I had assumed, and they move along nicely as the bass keeps walking and the horns keep singing, unrestrained and free. Near the end of the album, it does begin to feel as if it's repeating itself, but at least it's not a mess, which is why I appreciate it more than I thought I would. Sometimes it just takes time. Atlantic records, 1959. 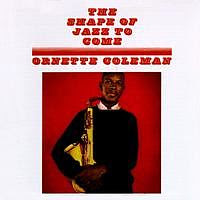 Coleman (alto sax), Don Cherry (cornet), Charlie Haden (bass), Billy Higgins (drums). Till Grunewald's Phonosource album was an impulse buy in a Tokyo Tower Records. They had some music playing in the jazz section and I listened while browsing, eventually deciding to buy since I liked what I heard. It worked! Not just your typical straight-ahead stuff, but nice compositions, thoughful melodies and structure, and nice production and packaging. I would look forward to more discs from these Swiss musicians. Definitely recommended, one of my favorite unexpected discoveries in 2005. 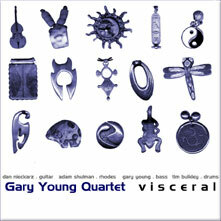 Local Bay-area players get together for some relaxing soulful music on Gary Young's Visceral. Guitar, Fender Rhodes, bass, and drums - played by Dan Nieckarz, Adam Shulman, Gary Young, and Tim Bulkley* respectively. It's sort-of jam-jazz music, gets into relaxing grooves (the relaxing feeling arising initally from the sound of the warm Rhodes and jazz guitar) and puts you in a nice space for several minutes at a time. The third track Faithful adds some female vocals (Janna Mordan) to add a nice extra in this relaxing set. The drums add some drive to some of the tracks, but nothing over-the-top or out-of-place. The compositions are mostly simple forms, semi-static in places but with room for the melody line to move around, and with enough happening by the supporting rhythm section to keep the groove interesting. The last track (Visceral) gets things moving a bit more than the rest, sounding a bit like fusiony, Chick Corea-type stuff. I'm not sure if you can find this album easily but here is Gary Young's myspace and website - you can listen to samples there. * As an aside, I've seen Tim Bulkley play drums a few times here and there in the Bay Area, and always been absolutely amazed. 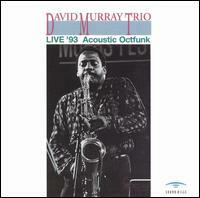 The trio here consists of tenor sax (David Murray), drums (Andrew Cyrille) and bass (Fred Hopkins). Murray is known for being a freeish, abstract player, but with some grounding to the chord changes. The first track on this album leads into a groovy sort-of calypso pattern, a bit like Sonny Rollin's St. Thomas. Murray is all over the range of the horn, squealing, honking, and making a mess of scales and note clusters - but not in a completely bad way. Lots of emotion and melody does come out through his extended solo on the first track, Calle Estrella. It's not as bad as all that (did I make it sound like noise? ), and actually can even be relaxing... in an unrestrainted, but somehow not uncalm, way. Good use of control may be what makes this happen. Like the title says, this is a live album and there is some crowd cheers and applause popping in here and there, which helps the musical environment take shape in your head as you listen. The trio does get people going at times. The second track, Joanne's Green Satin Dress, crawls along in a meandering, curious way. Feels exploratory. Next we get into more traditional bop-speed jazz in a performance of Mr. P.C, then Flowers for Albert (as once or twice before, another bass-only solo here while the drums and horn drop out - and a somewhat chaotic horn cadenza), and wrapping up with Acoustic Octfunk, where what sounds like a bass clarinet comes out to play. This last number is the only track where I felt there was more of a funky feel, which is fine by me. Given the title of the disc, I was slightly worried that it would be a bunch of funk jams. All in all, a nice record. May work best when you want to feel like you're out at a jazz festival (maybe outdoors? ), listening to a trio push a few boundaries here and there while remaining musical and having fun. Looks like this blog got linked to from a site called Top Ten Sources today. Thanks! Great playing, good compositions, but (first impressions...) something's not making it happen as well as I know Kikoski can do. Apparently this is his first all-original session, writing six songs which sound as if he's working on a concept album (Puddles of Memory, Shame, Disentanglement...) - are these song titles chronicling the end of a relationship, maybe? Kikoski always seems like a precise and in-control player to me - in his playing and composing as well. His compositions are jazz but he sometimes add dramatic elements of classical or other types of piano music into his songs. This album has more of that, and several pieces play with time signatures or syncopation... but for some reason feels a bit too... plodding?... to me. Not exciting enough. There are moments (I like how the album begins strongly with Revival, but overall it doesn't generate the same feelings some of his other records have done. Try Surf's Up or Combinations. Blake on saxophone sounds polished but maybe a bit too smooth - is it the equipment or just how he chooses to play? All that being said, I do have to admit that I'll listen to this album when I want to hear Kikoski, but have overheard his other recordings - it's a nice change, just not up to par with the other records he has available. Released in 1999, Kikoski is joined by Seamus Blake (tenor sax), Scott Colley (bass), and Jeff "Tain" Watts (drums).